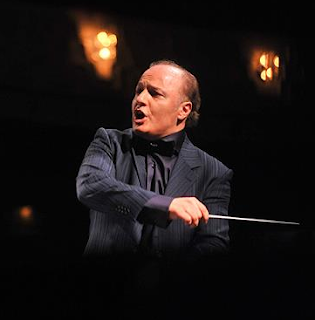 Unfortunately Rabi Simon Amirkhas did not live long to see his song to be presented by an arrangement for the symphony orchestra. But the Mesopotamian Night team is pleased to announce that this song will be a feature presentation at our 6th annual event in San Jose, California. Rabi Simon Amirkhas was born on March 24th, 1941 in Urmia, Iran. His parents were Dr. Malkom Amirkhas and Nina Bet David. The Amirkhas family moved to Baghdad, Iraq in 1947 after the looting of Assyrian villages and persecution of Assyrian intellectuals who were involved and represented Assyrians in the Azeri Democratic Movement in Urmia from 1940 to 1945. Rabi Amirkhas studied in Baghdad, Iraq, and in 1962 he graduated from Baghdad’s School of Law. It is known that he was the first Assyrian to be graduated from that school. In addition to Law, Rabi Amirkhas mastered Arabic language and literature and while he was only 22 years old, he taught Arabic literature in a university in Baghdad for three years. He was named “The Youngest Scholar of Iraq” by Iraqi Ministry of Education and Culture. In 1969, he moved back to Iran and married to Mariam Maghdoosi. The fruit of this marriage was one daughter Eilbra, and two sons Ninef and Rameil. While he worked as a law consultant for years in Iraq and Iran, Rabi Simon’s passion remained art and literature. Among his first publication was an Arabic translation of “Traveler of the Horizon” by Rabi Benyamin Yosip Gandalo which was originally published in Assyrian. Among his important works was a historical fiction in Arabic about ancient Egypt in the Assyrian period under the title "Blood In The Land of Pharaos" which was never given permission to be published in Baghdad. Rabi Amirkhas was also a prolific poet. His poetry spans a variety of topics from historical to romantic. A large set of his poems have turned into Assyrian songs around the world and can be found in many albums. Rabi Amirkhas with his family moved to United States in 2009 and settled in Los Angles California. Since then our Mesopotamian Night team had close contacts with him and we were working to select a set of his songs and poems for performance in our annual events. The first song that we chose was “The Epic of Ishtar-Tammuz” which was turned into a song by his son Ninef Amirkhas. Unfortunately, Rabi Amirkhas left us too soon on September 23, 2012 and did not get a chance to see the performance of his song in Mesopotamian Night events. 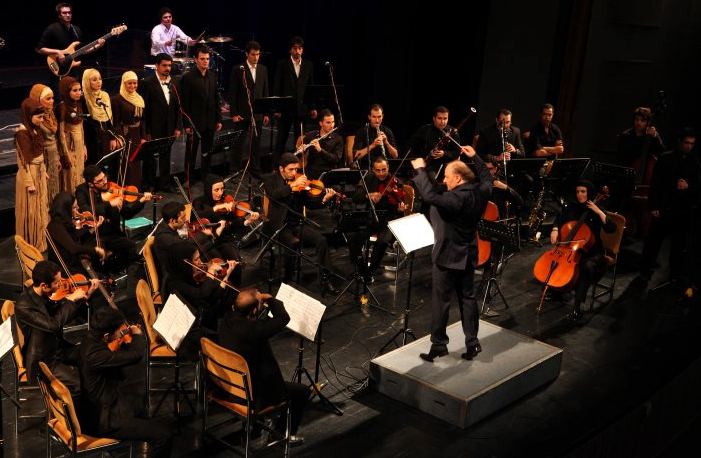 This song was given to Honiball Yousef, an emerging Assyrian musician and composer in Tehran, Iran and the founder of Beneil Music Academy (http://beneil.com/) and the Messiah Ensemble for orchestration and arrangement for the symphony orchestra last year when Rabi Simon was still alive. This song will be feature presentation at the 6th Annual Mesopotamian Night in honor of late Rabi Simon Amirkhas in San Jose California on June 15th 2013. 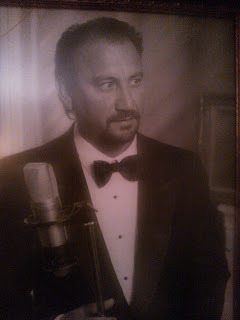 We gladly announce that our beloved Avadis Sarkissian is going to be one of the singers to perform the songs of the legendary Assyrian singer Edward Yousif, also known as King Biba, at the 6th annual Mesopotamian Night concert on June 15, 2013 in San Jose, CA. Every Biba fan knows Avadis and his enormous admiration of king Biba, so it was rather an easy choice for our team to pick a singer to honor the legend. "My name is Avadis Sarkissian. First and foremost, I would like to thank God for all the blessings and talents that he gifted me. In the year 1970, I completed my first song with Edward Yousif (Biba), a legend among Assyrian singers. A year later I left Baghdad, my birthplace, and moved to Lebanon. It was there that I began singing at Assyrian events. I immigrated to the United States in 1975 and continued singing at Assyrian parties. The year 1978 was a significant part of my life; it was the year that I was able to release my first record, consisting of two songs, one of which was "Atour Gabarta" and the other was "Beloun Parpisee." That year was also the year that the legendary singer Biba came to the USA and together we toured and performed around the country. In 1997, I traveled to Australia where I performed at the Assyrian Church of the East, Parish of Raban Hermiz. By the grace of God, I have released seven Albums and sixteen video clips during my singing career. I'm married to a beautiful wife, Shemiran, and I have four beautiful children named Sargon, Mariam, Nina and Linda. My singing talent apparently has passed to at least one of my children. My son Sargon has also become a singer and has released an album last year with eight new and original songs. I would like to give a special thanks to the talented Melis Ishaya for the production of my music as well as that of my son. I would also like to thank the Mesopotamian Night Project committee members for choosing me for this event. May God bless you and bless our fellow Assyrians." 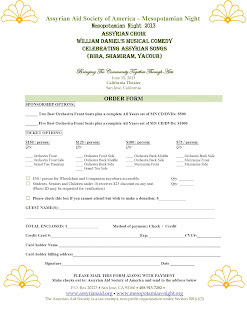 The article below is an overview of our Mesopotamian Night 2012 CD set by Dr. Eden Naby Frye one of our main sponsors in the past several years. The printing of this CD set was also partially funded by The Naby Frye Assyrian Fund for Culture in which she serves as the secretary and the treasurer of the fund. We would like to also inform everyone that the completion of the DVD set of our 5th annual event is also in progress and will be available soon. I just listened to the CD of Malek Rama Lakhuma (The Handsome Prince) that was recently issued by Mesopotamian Night. This is the first of a duo set from Mesopotamian Night 2012, a concert hall performance held at the Center for Performing Arts in Mountain View, California. 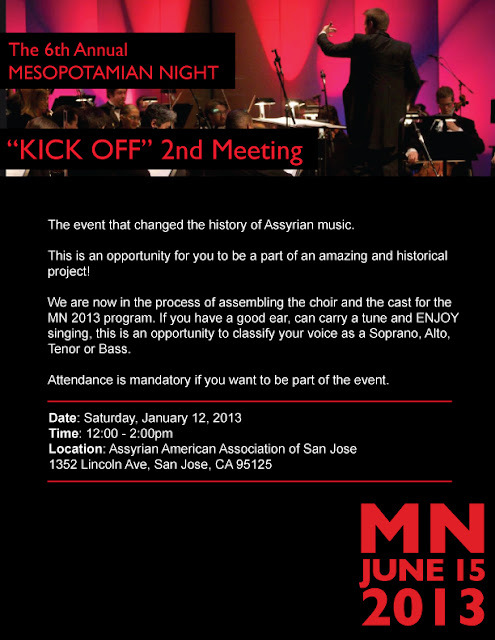 The date of the musical performance, Saturday February 18, 2012, marks a turning point in the professionalism of Assyrian cultural performance. Listening to the CD, I can appreciate the music more even than at the performance nearly a year ago because I am not as starry-eyed about that spectacular visual experience. Even when the DVD of the performance is released, hopefully soon, it will not have the magic of that performance on stage when a cast of singers, dancers and a fine orchestra really gave us a first class performance. But the CD is of good quality with the mellow narration by our Turlock based poet, the wonderfully cooperative Yosip Bet Yosip active in promoting Assyrian poetry at the World Poetry Congress. Yosip Bet Yosip’s narration is indeed an homage to the life of Hannibal Alkhas (1930-2010), the scion of generations of Assyrian cultural activists. Known widely as a painter, Alkhas’ poetry is less known outside his native Assyrian community simply because few people outside our community know our language and poetry is an artistic medium heavily dependent on language. That is one of the reasons the Mesopotamian Night performances are important for our cultural advancement: we can bridge from Assyrian neo-Aramaic poetry to attract a wider audience through music. But first we have to rediscover our poets: in this case the discovery of this Hannibal Alkhas poem, Malik Rama Lakhuma is owing to the publication by Marcel Josephson of Alkhas’ unpublished poems, among which was this wonderful folkloric poem now so well adapted to stage performance. Discovering our poets and musicians is the subject of the second disk in the set that is available so reasonably ($15.00). The series of Assyrian songs by the poet Misha Ashoorian and composed by Vania David have received modern interpretation and orchestration by Edwin Elieh and are sung by five of our contemporary entertainers, including Salem Sefo. That the original author Misha and composer Vania could be viewing the performance from the first row is a credit to the organizers. Let us see more of our 20th century recoverable poets’ works reinterpreted for contemporary audiences. And by all means, let us see and hear from the lovely Shamina Khangeldy and the rest of the talented cast of Malek Rama, especially Fred Elieh. The Naby Frye Assyrian Fund for Culture is pleased to have been offered an opportunity to fund, in part, this CD. 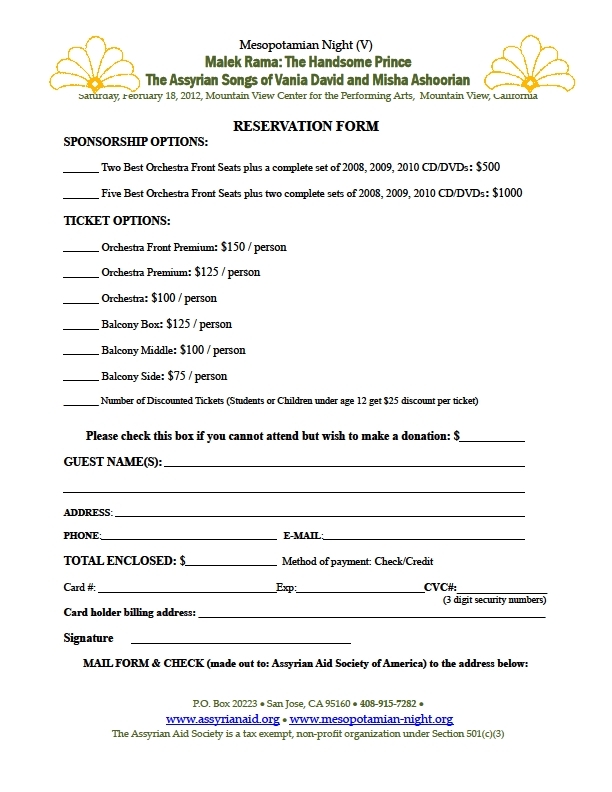 Mesopotamian Night 2012 Tickets for Sale Now!! The California Theater is an intimate, comfortable, and beautifully decorated hall, with 1,126 plush seats. No seat is more than 20 rows from the orchestra players or more than 20 seats from center. The theater's acoustics are excellent and the sound in the mezzanine is especially outstanding. There truly are no poor seats in this hall. 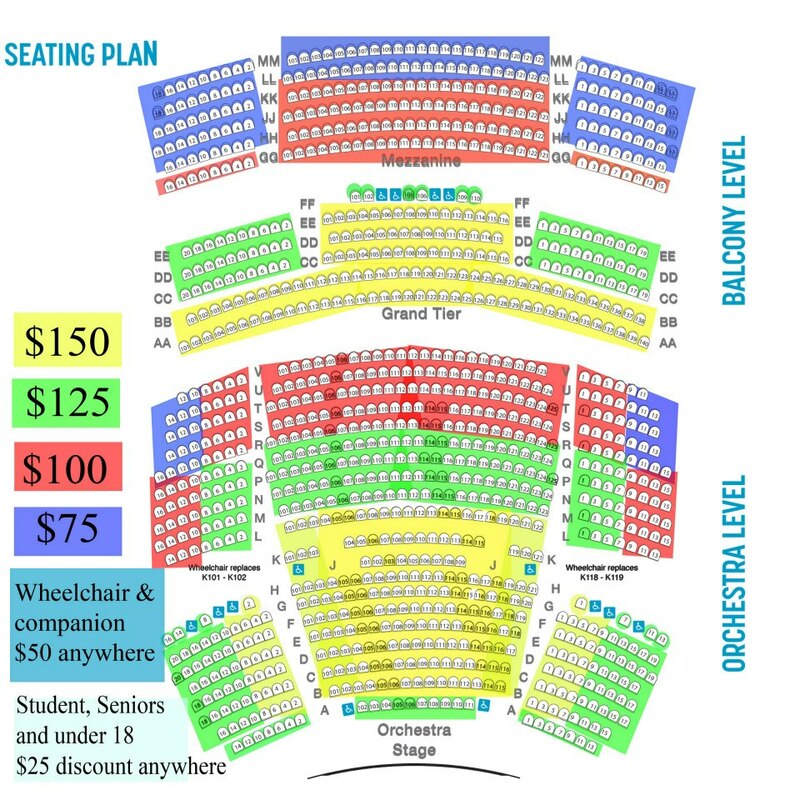 Both the orchestra floor and balcony levels have seats in all four price categories. Purchase from us by credit card using PayPal: No fees charged to buyers, we pay the credit card fees!! 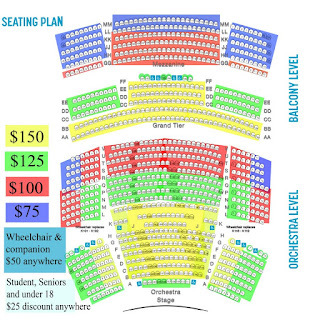 To purchase your MN2013 Concert Tickets, pick the tickets level then "Add to Cart". If you want to purchase more tickets click the "continue shopping" option on the PayPal page. 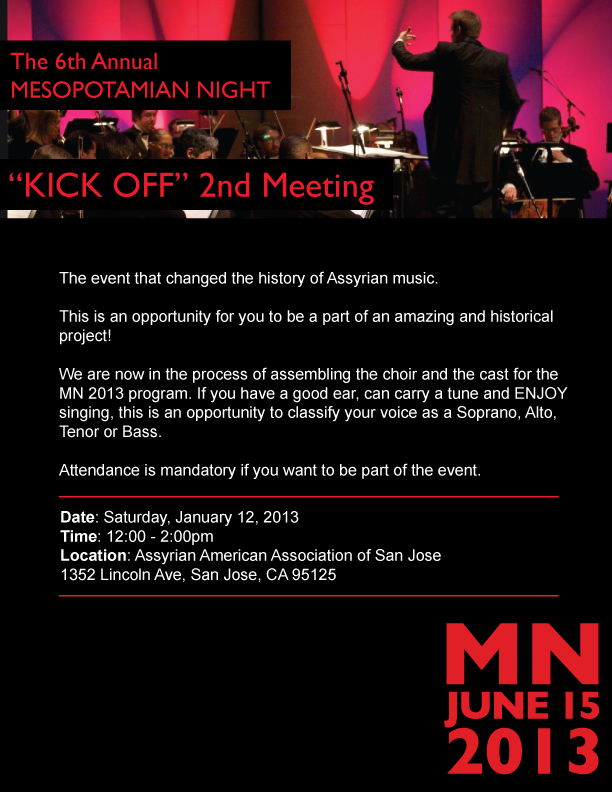 The second kick off meeting for Mesopotamian Night 2013 production is set for this Saturday at AAASJ building in San Jose. The flyer below provides more details.